Using a wood saw, chainsaw or axe, saw or chop off any remaining upper portions of the tree at the base. Use protective eyewear. Angle your axe chops so the portions cut away are wedge shaped. With wood bits, drill small (1/4- to 1/2-inch diameter) holes every 2 inches on the surface of the stump. The holes should be about 2 inches deep. Fill the holes with a commercial stump remover according to package directions. Alternatively, fill the holes with saltpeter fertilizer, and keep the stump moist to speed decomposition. Covering the stump with soil and keeping it moist will encourage the growth of fungus and other decaying organisms. Dig out the decomposed lilac stump with a sturdy spade after six months to two years of decomposition. Decomposition speed depends on the climate and how long the lilac has been dead. Most of the large roots will come out easily at this point, too. Clear all debris and rocks from around the stump, even rocks in the ground near the stump. Rocks cause the grinder to jump, a danger you want to avoid. 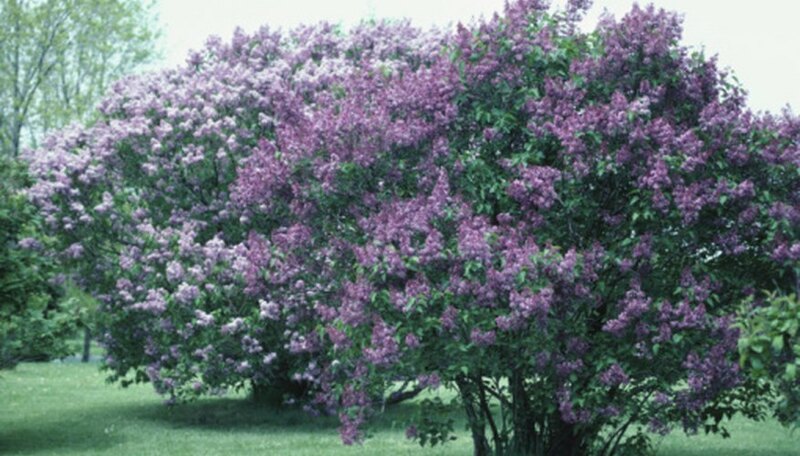 Cut the lilac stump as close to the ground as possible. The more tall, narrow branches you have to grind, the more the grinder will jump. Rent a stump grinder. Smaller, walk-behind stump grinders work well on lilac stumps, and are easier for homeowners to use. Make sure the blades are sharp. Ask the attendant if the blades have been sharpened recently, and if they can be sharpened before you take the grinder home. Move the grinder in slow, shallow, side-to-side passes across the stump. If the stump is wide, move the grinder forward as you make your passes to get the entire stump. Repeat as necessary until the stump is ground completely. If you need to clear chips and dirt away for any reason, turn the grinder off first. Remove large, lateral roots by digging around them with a spade, then sawing them out with a handsaw or a circular saw. To avoid losing control of the circular saw or damaging it, remove any rocks near the area before you cut.